Azul probably needs no introduction. Since its release in 2017, it has proven to be one of those unicorn-games that has managed to cross over, from hobby games, into more mainstream gaming. 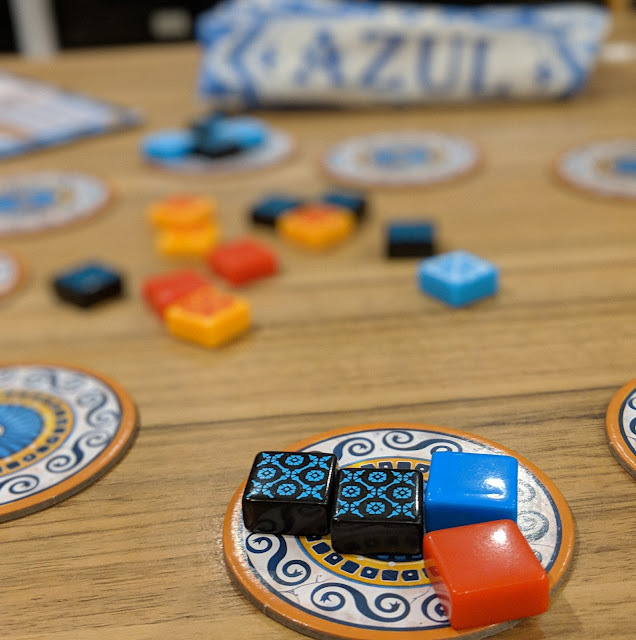 Last Christmas my Sister, who is not a gamer and who I haven't seen in years (she lives in a different continent), called me up to talk about Azul which she had just played. It is a competitive abstract game that is quick to teach and has a surprising amount of depth and it will give gamers and non-gamers alike plenty to chew on. It also looks beautiful on the table and if anything, plays too quickly, i.e. it is over before I want it to be over, two or three more rounds would always be welcome. All players are building a mosaic on their own player board from a collective pool of tiles in the centre of the table. Available tiles all start in a number of 'factories' that are placed in between all players. You must take all tiles of the same pattern from a factory, any tiles that didn't match your pattern are discarded to the centre of the table to form a common pool of tiles. You could just play this game concentrating on your own board, but the tile draw mechanism also allows you to jeopardise your opponent's best choices in a deliciously mean fashion. Of course, a casual gamer is probably not going to look for those 'take that' opportunities and will have a lovely time building their own mosaic on their own player board, albeit having to work through some unexpectedly tough decisions. 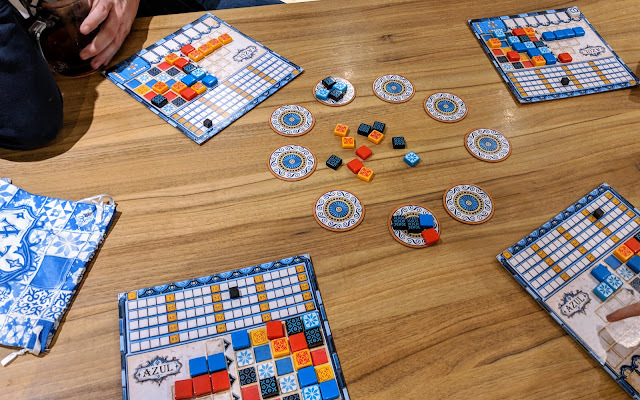 Those tough decisions, in all likelihood, have come from the experienced gamer or keen Azul-player at the table who may be looking for as many opportunities to minimise their opponents' choices. When you've taken one pattern of tile from a factory or the centre, you place them on a pattern line, which has one to five spaces available. Tiles can only be placed on empty lines, or lines that have the same tile in already and empty spaces available. If you can't place them on a free pattern line, then they drop to the floor line. Any tiles on your floor line will cause negative points at the end of a round. Any abstract game is always going to struggle with theme, but Azul probably has more of a theme than any abstract I've played. It's still fairly loose, but your actions and the overall look of the game reflect the process of building a mosaic work of art nicely. The end of the game is triggered when one person has one complete row. During my first game of this, my casual game group and I all raced to be the first to complete a row thinking that was a good thing. We did not appreciate that the end game scoring doesn't reward finishing the game. Players get far more bonus points from completing rows and using 5 tiles of the same colour in their mosaic. end thinking that was a good thing... However, after their 2nd and third consecutive plays of it, we were all a bit savvier and trying to score more points, over finishing the game. This endgame condition balances the gameplay nicely. When you're in the lead, you're pushing to finish the game as quickly as possible, which will probably cause you to lose scoring opportunities making you lose points relative to the other players. If you're trailing, you are able to engineer, at least if there are three other savvy players around the table much harder tile draw decisions for the leading player whilst maximising your own score. The player interaction, despite all playing to their own board, is high. The tiles are glorious and the art, although simple geometric patterns are again, evocative of the theme. The box looks and feels fantastic and it comes with a well-though-out insert. Unfortunately, my player boards are bowed which helps them to spin round like a record very easily. A complete game is anywhere from five complete rounds to an average of six to eight rounds. For me, the game is over just a little too soon. I know this is normally the sign of a tight and balanced game and in general this a good thing. However, I find I am enjoying myself so much that I don't necessarily care that I may not be winning and just want to build a nicer pattern and have more turns in which to do so... I think I may be an artist at heart. 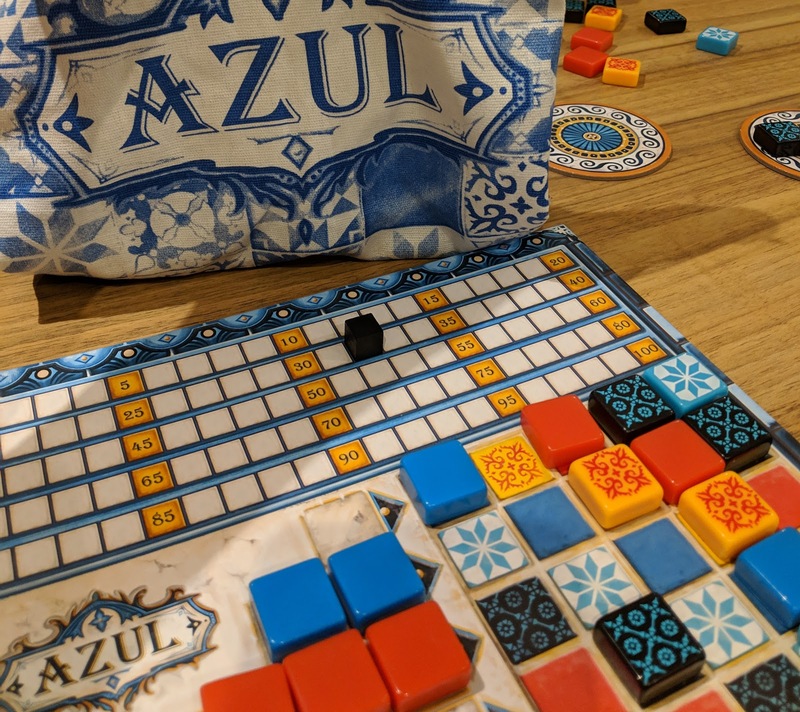 Azul is a heart-warming game, in the same vein as Patchwork and fully deserves its place as a modern 'classic', or at least, a soon-to-be modern classic. It is accessible for any type of gamer and although there's no direct conflict, there are certainly opportunities to mess with your opponents and it's this trait, being able to accommodate different play styles, that makes it appeal to any type of gamer. For me, it sits firmly in the filler category, taking about 40 minutes to play. I could see this easily becoming a firm family-favourite at holiday gatherings. I think I am correct in saying that every single game store will have a copy of this game on their shelves and you can use this link http://www.findyourgamestore.co.uk/ to find your nearest store in the UK.